Mixed backlinks – are links pointing to your site or your web 2.0 properties from several different platforms like: blogs, forums, guestbooks, etc… In short, blog commenting backlinks, forum profile backlinks, forum signature backlinks, guestbook commenting backlinks, etc… I hope you understand. 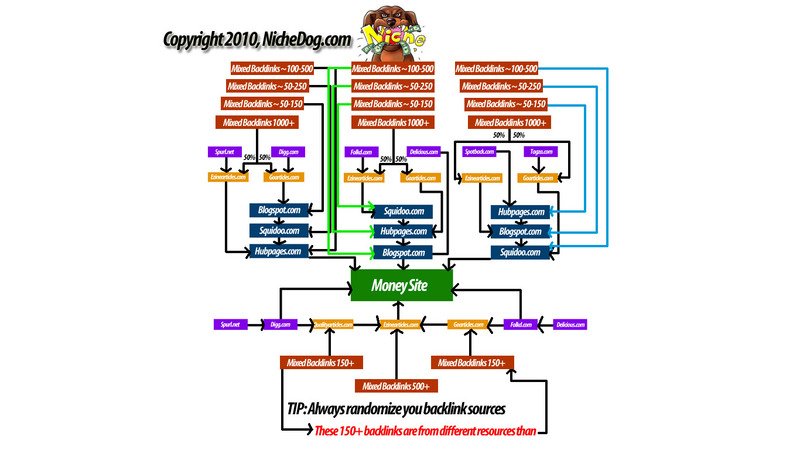 Numbers which are after “Mixed Backlinks”, indicate number of backlinks needed for each part of this diagram. These numbers are just my own estimates for ranking in highly competitive niche. This doesn’t mean that you’ll need 100+ or even 1000+ backlinks for each web 2.0 property that you’ve created. These backlink numbers depends on your niche, number of competing pages, competition strength, etc.. Also, sometimes it is not obligatory to create all these wheels. If your keyword is not in highly competitive niche, then 1 or 2 wheels might be enough. As you can see golftravelbags.com is already ranking in #1 position, but still can be outranked with my SEO method. Get domain like, golftravelbagsguide.com (exact match keyword is a must in domain name), and follow my step-by-step guide from previous post. Create ONLY 1 wheel, it’s enough for this competition, build backlinks like described here, and you’ll outrank that site in no time – I guarantee! I hope you’ve got the point of this example..
Now let’s get back to backlinking.. I’ll describe only the left side of this backlinking diagram, because middle, right and bottom parts are backlinked with the same principle. First of all I’d like to tell you about tools I use for backlinking. I mainly use my own custom made software which helps me with blog commenting, guestbook commenting, forum and web 2.0 profile creation, etc..
Another software which helps me with backlinking is ScrapeBox, I mainly use it for scraping websites (to leave backlinks later), arranging them by pagerank and commenting on blogengine.net blogs, which are not supported by my own tool and Xrumer. Plus, ScrapeBox has some other great features like mass ping, rss submission, etc.. ScrapeBox comes with video tutorials, which will help you to get started. And the best part – It’s cheap! Official price is $97 but you can get it for $57 if you follow this special discount link. Step #1: I usually start backlinking from article directories. So, if I have a chance to create 1000 backlinks, I’ll split them and forward 500 to Ezine Articles and 500 to Go Articles – that’s what 50%/50% in my diagram mean. For the article dir’s part of the diagram, I try to spam the hell out of them, and by that I mean that I send as many backlinks to them as it’s possible for that moment. Don’t forget to use your keyword or several variations of it in backlinks anchor text! Now here is very important tip: your backlink sources must always be random and differ from sources from previous backlinking steps. For example: If you sent 3 backlinks to ezine articles and 3 backlinks to go articles in previous step from sites: a.com, b.com, c.com for ezine articles and d.com, f.com, g.com to go articles, you shouldn’t repeat backlinks from these same sites in neither of the next steps. Step #2: In this step we’ll backlink our Blogspot page (as you can see, we are moving from top to bottom backlinking our web 2.0 websites). Point somewhere from 50 to 150+ backlinks to this page. Again, always use your keyword as backlinks anchor text. Don’t be scary, these (web 2.0) pages won’t outrank your money site. Even if they do, that’s a big plus for you – for now. Step #3: In this step send somewhere from 50 to 250 or more backlinks to your squidoo page. That’s all for now.. Repeat the same process for your other wheels by following the diagram. If anything is unclear – comment, and I’ll try to answer asap!